Choose life. Choose a lake. Choose a swim. Choose a bait. Choose a rig. Choose sleepless nights under the stars. Choose the nocturnal music of branches creaking in the wind, leaves whispering, and the eerie night-calls of owls and wildfowl. Choose bright moons shattered in the rippling surface of lakes, and purple skies at sunset perfectly mirrored. Choose silent mist-shrouded pools at dawn. Choose visions of white-flowering waterlilies turning green-gold in the half-light. Choose the flashing bronze flanks of carp, twisting below the surface, on the edge of visibility. Choose a heightened heart-rate. Choose an emotional rollercoaster. Choose the psychological assault-course of planning, watching, locating, preparing, casting and waiting. Choose the endless hours of strung-out anticipation. Choose the rush of striking, hooking, fighting, and landing (or losing) the fish. Choose to walk the tightrope between desperate failure and the adrenaline-inducing, life-enhancing triumphant high of success. Choose life. Choose obsession. Choose Carp Fishing. An interview with Bev Clifford, sponsored angler, Team DNA and Advertising & Marketing for Carp Talk. So then Bev, when did it all begin? Where was the first place that you wet a line? With my Dad being the specimen angler that he is I guess it is more something that I was born into. I grew up in a house with fishing magazines, books, pictures, stuffed fish everywhere. 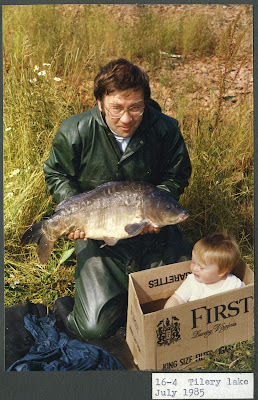 With my Dads angling friends popping round all the time and my Dad working in the industry I was just always around angling. We had ponds in the garden, which is the first place I wet a line. Also the first place I fell in as well! When did you begin to target big carp? Carp fishing goes from strength to strength each year. Like myself, you target big carp, did you just follow the trend? With me working in the industry ever since I left school I don’t think I am just following a trend by rather doing something that I love spending my time doing, that is in my blood and something that I am also lucky enough to make my living from. Can you tell me, and everyone reading this interview, more about your personal angling? I don’t get fishing as much as I would like due to work commitments and also enjoying doing a lot of running as well. My weekends are split between trying to balance running, spending time with family and friend and fishing! When I do go though, I enjoy both social fishing with friends and also going on my own. My personal angling is very simple, laid back approach. I don’t put myself under any pressure and to catch carp at all cost. I like to enjoy my time on the bank being away from the day to day stuff, doing everything at 100 miles an hour! My current personal angling is trying to get my head around a very deep pit with some very big commons in it! Do you have a memorable capture? I have a few, my first UK 30 is certainly high up there though. What’s the best piece of advice you could give to anybody reading this regards targeting big carp? Enjoy you fishing, respect other anglers and the countryside around you.